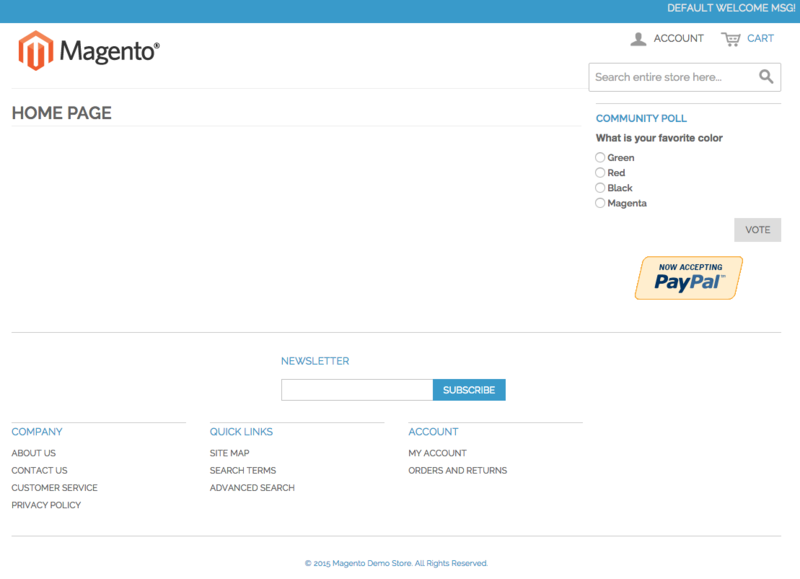 This guide explains how you can install Magento via cPanel. The process includes 4 main steps and has many screenshots along the way to help explain what needs doing. Magento is arguably the best off the shelf e-commerce platform that could prove to be an online catalyst for any business that needs to reach out to customers to sell a product. It offers the full mechanics of product listing, inventory control, cart and checkout handling, confirmation order and shipping emails and revenue reports. Developed in 2007 during the e-commerce boom, plenty of businesses have taken to converting to Magento which provides an all in one solution; whether you have just started a business, you operate a small business or a large business, this useful online system can easily be the central cog in your company. The best part about Magento is that the community edition is completely free. You may be thinking that perhaps it is limited in some way and there must be a catch that forces you into a paid subscription type cycle to unlock it’s full potential, but honestly, there isn’t. Magento has also received a huge amount of support from developers across the globe, creating some fantastic custom modules to truly make it even better. They all live on the Magento Connect marketplace. Some modules are free, some are paid. They offer solutions such as Sage integration, payment modules, shipping modules, even personalization modules to help you adapt your website to suit your business. Reading the official Magento installation documentation can be overwhelming, with the installation process heavily relying on FTP access and file uploads, MySQL database and MySQL user creation. However, the process doesn’t have to be overwhelming thanks to the ‘Softaculous Apps Installation. The installation process can take between 5 to 10 minutes to complete. This is arguably quicker than downloading the initial Magento installation files. If you’re unsure how to access your cPanel account or whether you have Softaculous available, contact your web hosting provider’s customer support for more information. Softaculous will usually have the latest version of Magento available for you to install and give you the information about the release date and possibly other versions available. The installation process is also helpful by explaining to you how much disk space the Magento framework will require and summarise what disk space your account has available. Softaculous will clarify with you what option of Magento that you would like to install. It is always worth noting the version release date; the reason for this is because if it’s only just been released (such as within a few weeks), you might want to consider an older version. Often with new software, there can be system bugs so it’s wise to choose an older version and let someone else test the new software! Also if you are one step ahead and you have your eye on a particular module from the Magento Connect marketplace, it is also recommended to review what version that module supports before proceeding. 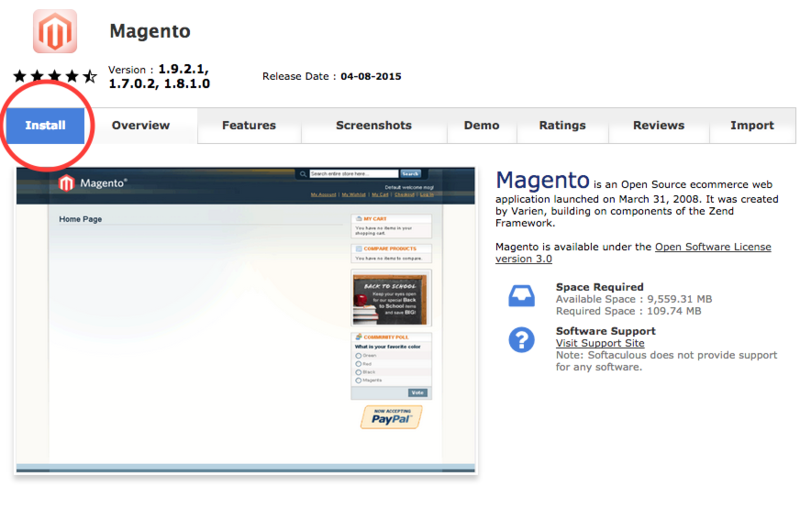 Version – In our example, we’re installing version Magento 1.9.2.1. Version 1.9 has been reliable for months so it’s an acceptable choice to proceed. Protocol – http:// is the default option offered which should be chosen unless you already have an SSL certificate installed on your account. If you opt to add SSL later, don’t worry, the protocol can be easily changed through the Magento system configuration settings. Domain – If you have multiple domains on your account, you may need to choose the domain that you would like to install Magento on if it’s not already shown in this option. CRON Job – A CRON is basically a script that is executed at certain points. It’s important with Magento that a CRON is set up because this is relied on for sending order emails. The default installation is setting this to every 2 minutes which is perfectly acceptable. Admin Path – It’s important to understand that the admin path is going to be the heart of your Magento website. It’s the area where you manage the entire website; adding products, content pages, creating and printing orders, customer management and system changes. 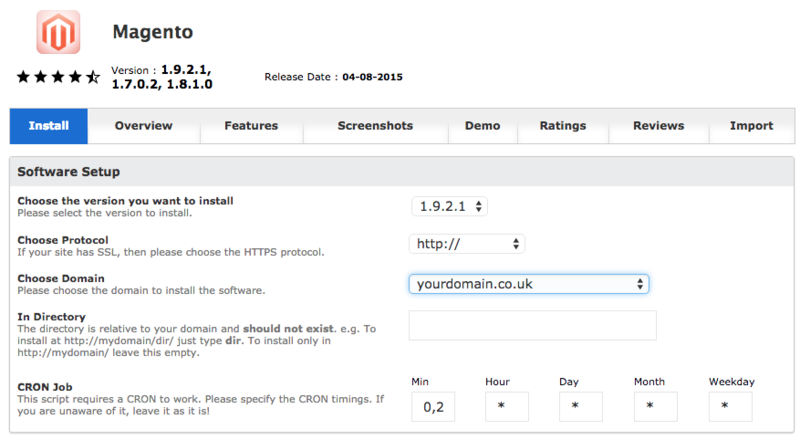 By default Magento chooses the admin path ‘www.yourdomain.co.uk/admin’ but our installation example here has set this to ‘/admin123’. It’s at this point that you can choose whatever path you like; some argue that you should make this cryptic but honestly just make sure that is simply memorable as you’ll end up typing it many times in the future when accessing the back-end admin panel. Database Settings – There’s no need to modify this, the installation suggestion is absolutely fine. Admin username – Self-explanatory; this username will be the name required when logging into the Magento back-end. Admin password – The most important part; it’s critical to choose a secure password and not keep the default suggestion by the installation. ‘password1’ is a terrible choice as it could expose you to security breaches. Remember it’s common practice that your password should include a mix of letters and numbers for good security. Noting this down on a piece of paper along with your username is recommended at this stage so you can easily reference back to it once the installation process has completed / at a later stage. First Name and Last Name – Again self-explanatory. This information is only shown through the Magento back-end. If privacy is a concern, this information doesn’t go on show throughout the public site of the site. Admin Email – If you incur sudden amnesia and forget your Magento back-end username and/or password, it’s important that the admin email in this section is a valid email address that you can and will always have access to in order to reset the access information. Feel free to peak inside the ‘Advanced Options’ but starting out there’s no need to add any more configurations. At this stage, we’re happy to continue with the Magento installation. Proceed by choosing the ‘Install’ button. Now it’s time for a breather. The Magento installation will start processing all of the data options that you’ve provided, ensuring that they are all acceptable configurable options. The installation suggests that it will take between 3 – 4 minutes (variable depending on your web hosting provider’s hardware). Sit back, pop the kettle on and allow the installation to complete. Once the installation has completed, the process will congratulate you on its success and confirm the website domain that the software has been set up on and repeat the important Magento back-end’s admin panel URL. It’s worth adding that once the installation has finished, Softaculous will send an email to your web hosting’s email address, repeating all of the important details related to the Magento set up. This will include the version of Magento installed, the domain, your back-end username, password and email choice, along with the MySQL access information that has been created on your behalf. It will be helpful to reference back to this at a later point in the future. Success! It’s now time to take a look at the brand new Magento e-commerce website. Now that the basic installation has taken place, the fun starts, tailoring the many options that Magento provides to make your mark on your new website. Do you have a site logo? What products will you add? What will you write to welcome new customers in? Product shipping options? What payment method are you going to accept? By default Magento has set up its basic ‘responsive web design’ theme dubbed ‘RWD’. At a first glance, it seems clean cut but desperate for customizing. For anyone who hasn’t come across the ‘responsive’ term before, this means that the design will automatically fit to any device that the website is browsed in, such as a slimline view for a smart phones like iPhone or Samsung, or a little wider for tablets like the iPad or Nexus, or straight forward full width to your desktop or laptop monitor. We can see that Magento offers a header section including the default logo, welcome message, and a mini menu that includes the option for customers to access their account area or their cart, to view what products have been added. The homepage is a blank canvas and will become the key part of your website that will welcome your customers in and funnel them through your products and to the checkout process. The default Magento theme has a column based page structure. By default we have the page main content on the left with a narrow column panel down the right that has as community poll and an advertisement that PayPal is accepted. Further down is a centered newsletter subscription box where customers can type in their email address and keep up to date on what news you’d like to inform them with. Finally, in the footer, the default site is complete with a three column link list which can be helpful reminders on what information you should be set up on the site as standard. It’s worth remembering though that everything can be customized. Customizing the Magento website is done by accessing the back-end admin area to delve deep into the core configuration options. In ‘Step 3’, it was recommended to note down your admin area URL (and choose something memorable). It’s now time to type that in. Please remember that if you’ve forgotten the admin area URL, you should have received a copy by email. 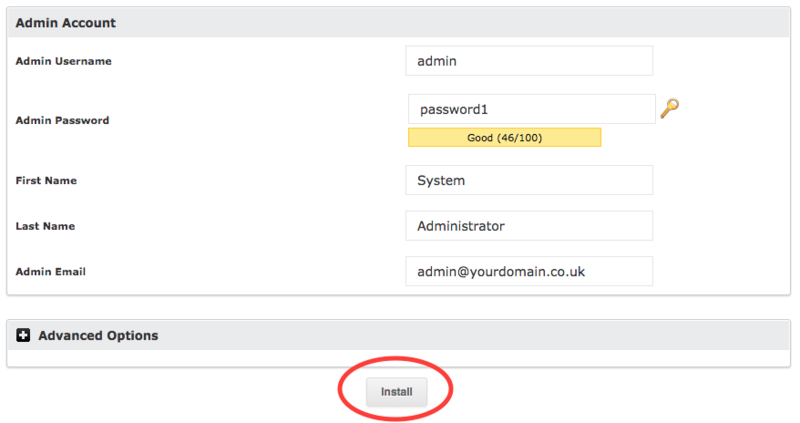 Enter your admin username and the secure password that you chose in Step 3 into the respective login fields. Choose the ‘Login’ button to proceed. It has been referenced before but it should be clear that practically every e-commerce option imaginable is set in the Magento back-end Admin Panel. This is the area that you’ll spend most of your time. It’s important to remember that this article is mainly to guide you through the Magento installation process but it’s worth reading further on to understand what options are available next and to start thinking about ideas and structure for your new e-commerce website. Magento is structured from the very top as the company down to product categories (or departments), products themselves and further down to associated products (or child products). Imagine that your business sells clothing. Inside that clothing store, you have t-shirts, trousers and shoe departments. Further down the chain, you have different styled t-shirts, trousers, and shoes in a variety of colors and sizes. To structure your site, you’d need to create a shop category, inside that would be clothing, then t-shirts that need to be configured to show the customer an option of color choice and size. Thankfully Magento takes care of these options. When categories are created, it will automatically create you the menu links on the website in the main navigation. If we have categories Clothing with T-shirts as a sub-category, Magento will set up that menu option and show Clothing -> T-shirts. A product is then created and assigned to a category which will automatically appear in that respective section. A configurable product such as a t-shirt with variables such as size and color can easily be created. The most important part of any business is the sales section. Incoming orders to your website will appear in a quick view list where you can see the customer, the value and what status the order is. The status, of course, is an important part to note to see whether it’s been paid for, invoiced and ready to be prepared and shipped to the customer. Inside each successful sale record is the information about the customer, billing address, shipping address and what has been ordered. Magento provides a printable invoice which can go to fulfillment to be completed and it’s likely you’ll include a copy to the customer too. Once the order has been dealt with, it can be marked as shipped (even with a tracking number). Magento has the customer data and each status change (such as shipped) will automatically issue the customer with an email so they can keep track of the progress. During the checkout process, it’s important to ensure that you are charging the correct amount of tax to your customers especially when you have international customers where tax varies. Magento allows you to create tax zones to charge the right amount to the right customers, taking tax off or on, depending on their location. Magento is very helpful at holding all of your customer data. You can import customer records if you are changing systems or create new records. Building this information up is an important part so you can use the information at a later date for promotions or simply see previous order history. Magento has it’s own inbuilt newsletter system where you can create a newsletter template and send this off to your subscribed customers. You can also manage who is subscribed and who is unsubscribed. Sale, revenue and stock reports play important parts of any e-commerce business. Magento gives many simple or complicated daily, monthly or annual reports so you can track trends. The reports can help track sales trends, products that are running low on stock or simply help prepare for the next term. The CMS, or content management system, gives you the ability to create pages on your website. This can range from customizing the homepage of your site or simply to information about your company. Magento offers two ways how you can create your page either through a WYSIWYG editor, or what you see is what you get, similar to ‘Word’ where you can change text font or color through a menu, or for those a little more advanced, straightforward HTML markup. The system configuration section gives you the tools to configure everything about your website, such as the design or what payment options you’d like to offer at the checkout. The options are endless and they may seem at first to blow your mind away, but honestly, they’ll become familiar with time. Just remember that everything can be configured and it’s highly likely an option available in the system configuration.